Watch Chris Pratt fall in love with a bacon sandwich named Tony. 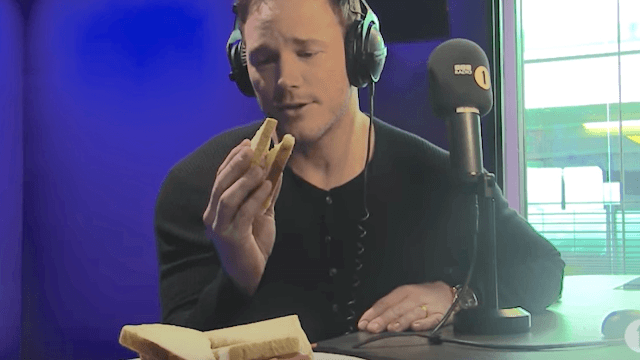 During an interview with BBC Radio 1, Chris "What's My Snack" Pratt showed off his amazing acting skills by performing two scenes with his co-star, a bacon sandwich. He didn't do this of his own will and volition, it's not like he just sat down and started talking to food. Rather, the host buttered him up (FOOD PUN) by telling him he was such a good actor he didn't even need another human in a scene with him to make it realistic. In the first scene, Chris Pratt has to pretend to fall in love with this bacon sandwich. He gives it a back story (they're in space), and a name (Tony), professes his love and goes in for the kiss but—TWIST—then he breaks its neck. Cold, Chris. Cold. In the second scene, poor Tony Bacon Sandwich is dying (probably because Chris Pratt broke its neck in the previous scene) and Pratt gives a convincing portrayal of a man who is heartbroken to find out his buddy is passing away, and who is also apologetic for the really cheesy music the host decided to play for ambiance. Someone give this man an Oscar! And give Tony one, too—he does the best bacon sandwich I've ever seen.